Charles Schultz was born in West Seattle. By early teenage, Schultz had acquired a trunk full of female clothing, and often rode on the city streetcars where she passed easily. She got work at the local Florence Theatre. Her family and friends were aware, and proud of her professional photographs. 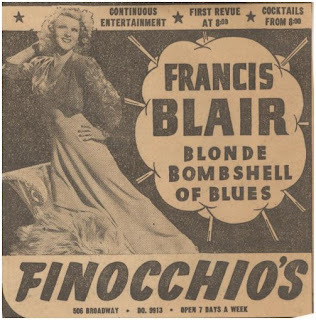 She took the stage name of Francis Blair. In the 1930s Francis was in the chorus line of the Rivoli Burlesque. Her gender was known and her dressing space was separated from that of the cis women by a screen. She sometimes played the organ for the show. She was in the dishwashers’ union in case no theatre work was available; she was an officer in the performers’ union. Very unusually for the time, Francis wore her hair long, and did not have to wear a wig. When out in male persona, he concealed it under a hat. Francis was one of the first performers to join the Garden of Allah in 1946. Syndicated columnist Walter Winchell wrote about Francis as ‘the boy with the million-dollar legs”. She was known for her singing, but also danced, stripped, produced shows and designed costumes. During the Korean War, Francis did shows for the United Service Organizations (USO) which provided entertainment for the US Military. A rather prim hostess of the show had a fit when Francis stripped down to only a G-string. She was also a comedian and in contrast to her usual glamor act did a double act with Kenny Bee as ‘Two Old Bags from Tacoma’ where they wore old clothes with holes in their stockings. 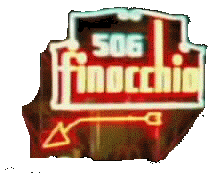 They took that act to Finocchio’s in San Francisco as ‘Two Old Bags from Oakland’. Years later, Francis and her husband of 20 years took a vacation in San Francisco, and they were attacked in Golden Gate Park. The husband and their dog were killed. Francis was left to drive home to Seattle alone, and was killed in a car crash in Oregon. *Not Charles Schultz the cartoonist. Don Paulson. “Gay History: Francis Blair - Seattle's quintessential female impersonator”. Seattle Gay News, no date. Online. Don Paulson & and Roger Simpson. An Evening at the Garden of Allah: A Gay Cabaret in Seattle. Columbia University Press, 1996: 135-141. Gary L. Atkins. Gay Seattle: Stories of Exile and Belonging. University of Washington Press, 2003: 63. Melissa Gohike. “San Antonio’s Drag Culture of the 1930s and 40s”. The Top Shelf, October 22, 2012. Online. As with Jackie Starr, there is no mention of Francis in either Lawrence Senelick's The Changing Room or F Michael Moore's Drag! Male and Female Impersonators on Stage, Screen and Television. It is odd that we do not have a date, not even a year, for Francis’ unfortunate demise.